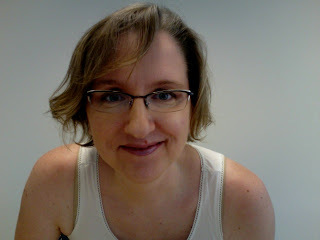 Here's one last picture of me before I go to Blogher for the first time. Thought I ought to have a "before" picture in case there's so much change during that an "after" picture is warranted. Probably all the change is going to be on the inside, though, isn't it? Not pictured: 1. jewelry, because I just plain forgot and 2. my shiny silver toenails because I'm simply not as flexible as I used to be. Give SueB0b a hug for me!